Whether students and teachers are blogging “what if” scenarios about a Harry Potter book or visiting online Holocaust museums as they read The Diary of a Young Girl, student engagement in the activities can enhance the reading of the book and enliven the small group book discussion with teachers and students in August. View our school’s suggested books and activities: Teacher Favorites 7/8 and Teacher Favorites 5/6. Families can also build excitement for summer reading by placing an importance on reading habits in their home. This suggested Reading Inventory provides ideas to start conversations about the enjoyment of reading and how books can be an important part of the summer routine. Below is a checklist to jumpstart how families can infuse a reading climate in the home and include the reading habit alongside the demands of summer activities. Step One: Make a Shelfie. What were the books that ignited you as a young reader? Arrange those books for a “Shelfie” photo and share with your child the meaning books had for you. If you no longer have the books, capture screenshots of book covers or use GoogleSlides to arrange your Shelfie stack. Interesting conversations about books can arise as you share the types of books you loved to read and how your reading grew or changed. Modeling your love of reading and your reading habits is a powerful message to children. 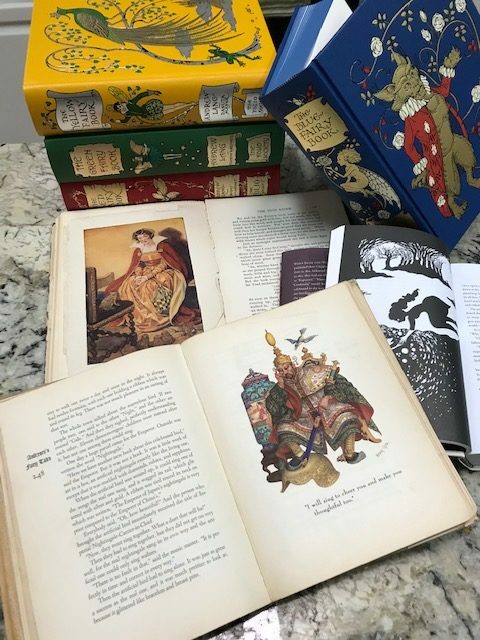 Fairy Tales (upper left to right): Andrew Lang’s Fairy Tales, Brothers Grimm Folk and Fairy Tales edited by Jack Zipes, Andersen’s Fairy Tales (copyright 1945), and Grimm’s Fairy Tales (copyright 1928). Step Two: Create Book Reading Corners. Where are the prime locations for Book Reading Corners in your home? Do you have a basket of books by a favorite reading chair, bedside table, and even magazines or books in the bathroom? 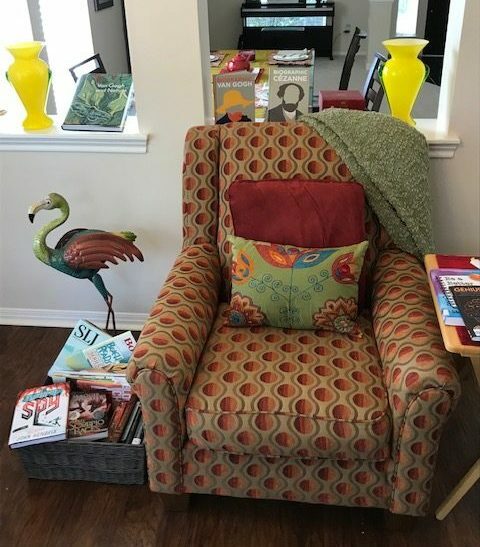 All of these are prime locations to make reading opportunities readily available and enjoyable, and these reading corners are a visible reminder of the value your family places on reading. Encourage your child to personalize and develop their own favorite reading corner. Step Three: Read Poetry, Aloud. My mother loved to share a large volume of children’s poetry, and she dramatized, sang, and engaged us in choral reading of the poems. She even (gasp!) invited us to write our initials next to our favorite poems and color in the line drawing illustrations. This poetry book became a living, breathing reflection of our time shared in enjoying poetry. Discover your own poetry anthology such as those by poets Shel Silverstein, Jack Prelutsky, J. Patrick Lewis, Paul Fleischman, Lee Bennett Hopkins, Margarita Engle, Naomi Shihab Nye, Jacqueline Woodson, and Nikki Grimes. Poetry anthologies are also themed to experiencing art (Hopkin’s Make the World New: New Poems Inspired by Art from the Metropolitan Museum) and even objects (The Death of the Hat: A Brief History of Poetry in 50 Objects, selected by Paul B. Janeczko). And, poetry is not just for young children. Poetry connects to tweens and teens in dynamic ways that reflect their own voices and concerns. Poetry can transport the reader through a historic moment (such as the sinking of the Titanic in The Watch that Ends the Night) and personal crisis (such as Jason Reynold’s Long Way Down), or celebrate heroes (such as Margarita Engle’s Bravo! Poems About Amazing Hispanics) and feature voices of hope (such as Naomi Shihab Nye’s Voices in the Air: Poems for Listeners). Encourage your tween or teen to perform a Poetry Slam of a favorite poem. Poems spoken aloud allow us to savor the sounds and rhythms of words and connect powerfully to emotions. Reading aloud creates moments of bonding with your child as you share the mutual love of a book. Dive in and do the voices, and invite the child to chime in on favorite lines or read a page in the story. You can read aloud a chapter book that is above the reading level of your child, thereby building vocabulary and encouraging empathetic listening. Many children’s books have cliff-hanger chapters and cause children to beg for the next chapter to be read. For an extensive list of read-aloud books for all ages and genres, see Jim Trelease’s The Read-Aloud Handbook. Jim Trelease stresses that reading aloud not only increases I.Q., but also H.Q. (the heart quotient). Award-winning children’s books from ALA and books for young adults from YALSA are another way to select excellent writing from diverse voices. Step Five: Books on the Road. Summers are busy with family road trips and commutes to activities such as swimming lessons and ball games–perfect opportunities for stretches of time to enjoy books. Encourage your child to pack favorite books in the car (I always traveled with collections of fairy tales) or take advantage of wonderful audio performances of books to enjoy as a family. Many public libraries have audiobook collections, and our own school library is showcasing new audiobooks through Overdrive this summer. For quick free browsing and sampling, you can search a book title in Amazon Audible and listen to a few minutes of a book. Listening to audiobooks can be a delightful way to fill long car commutes, and children can read along to reinforce the experience of the book. Illustrated books, nonfiction informational books, and short story collections travel well because these books invite browsing, lingering over illustrations and short text boxes, and short chapter reading. Author Melissa Stewart’s Celebrate Science website has wonderful recommendations for informational books and activities. Graphic novels, magazines, and comics can also be good choices for books on the road. Classic Comics were my first exposure to the “classics,” and new graphic novels adaptations include Anne Frank’s Diary, the Graphic Adaptation, The Giver, Manga Classics, and Shakespeare, Poe, and The Odyssey adaptations by graphic artist Gareth Hinds, not to mention the hilarious Hazardous Tales history series by Nathan Hale. This five-step Reading Inventory may help families re-evaluate the importance of reading and reading habits in the home. See also the National Education Association, which features research on preventing the “summer slump” and provides tips to encourage reading. Spark enthusiasm with families for reading this summer!